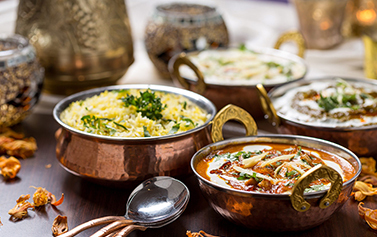 Located near the famous Loch Leven, in Kinross, The Raj Mahal offers authentic Indian and Bangladesh cuisine. We are just a few minutes’ drive from the M90 motorway so if you are exploring the area or live in neighbouring towns, why not give us a try – you’ll not regret it. Not sure what to have? 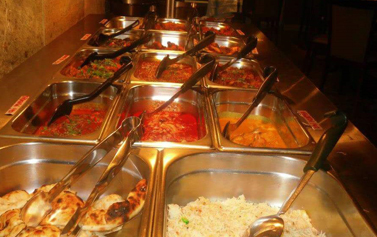 You can sample a selection of our popular dishes from our all-you-can-eat buffet, available Monday and Tuesday Evenings from 6pm until 9pm – great value! For the discerning palette, we offer a number of “speciality” dishes, carefully prepared by our experienced chefs. If you prefer a great meal in the comfort of your own home or hotel, give us a call and it will be ready for you to collect in no time at all. Please check out our extensive menu on this site. We look forward to serving you – bon appetite! 2 Side Dishes, Ice Cream buffet! Excellent flavours, freshness, quantities. This quality would gain high level attention in the major cities across the country. Really tasty meal. Wife was particularly happy with her veggie option of sag paneer! Great stuff. Excellent and tasty, thank you. Deep fried chicken with gram flour & fresh spices, served with salad & sauce. A combination of chicken tikka, lamb tikka, seekh kebab, tandoori chicken & tandoori king prawn. Served with vegetable curry, salad & naan bread. Tender pieces of lamb cooked with green peppers, onion & tomatoes, in a medium sauce served on tawa.